Happy Birthday, SING! Do you know its origins in Midwood High School, and how it spread to other schools? A fascinating read from alum, Ellen Levitt. Read the full article at the Brooklyn Daily Eagle. Click image to go to the full article. 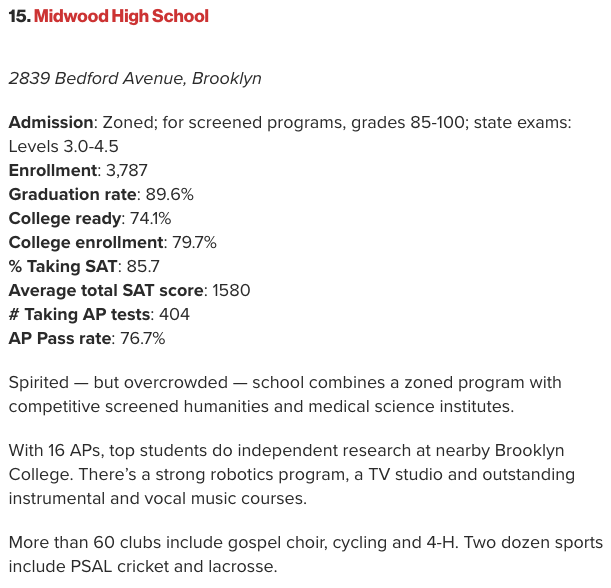 The New York Post ranked the Top 40 public high schools in New York City, placing Midwood at #15. An oldie but goodie, this New York Times piece from 2004 covers an English as a Second Language program unique to Midwood H.S. where cafeteria food is put to a creative, new use. WNYC's Yasmeen Khan visits Midwood H.S. during its 75th Anniversary Jubilee to delve into the school's history and present. Read the article and listen to the radio broadcast. Chalkbeat interviews Harris Sarney, Midwood graduate and teacher of 22 years, and Lisa Napoli, Midwood class of 1980. Get the full story. The Brooklyn Daily Eagle wrote a lovely article on Midwood's history, notable alumni, and the upcoming Jubilee. Get the full story.